Reconsider the CBD’s boundaries, are there blocks that the CBD should expand to? Adjust the services provided and the management plan to better meet the needs of the changing Castro/Upper Market and the changing city. Explore the role of the Castro CBD in the district. The first step for renewal is a feasibility analysis to develop an early and initial understanding of the need and the interest of the property owners in the services provided by the community benefit district. The feasibility analysis involved mailing a survey (in a self-addressed stamped envelope) to the property owner for every parcel in the district. The survey was also mailed to the property owner for each of the parcels in the possible expansion blocks. The feasibility analysis for the Castro CBD is here: Feasibility Analysis_CastroCBD. 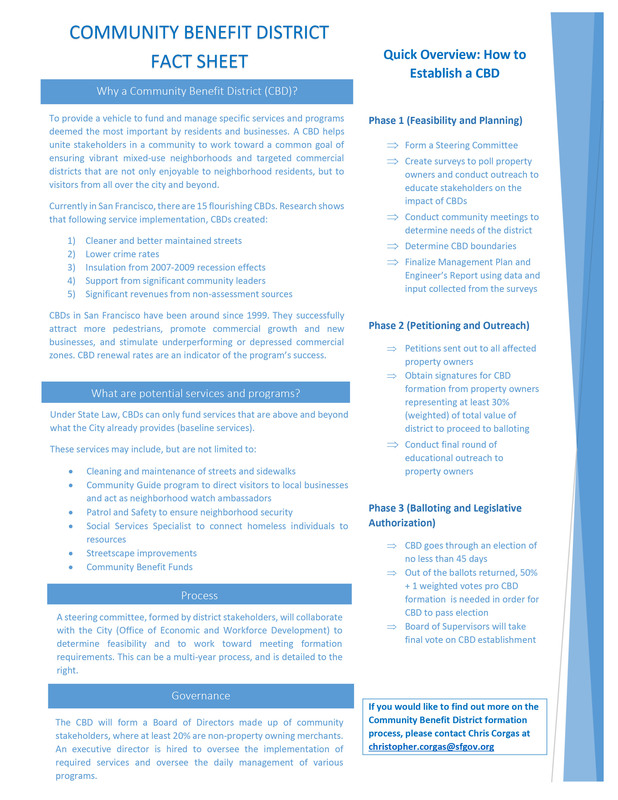 What is a Community Benefit District (CBD)? CBD Community Meeting – What is a CBD?